Get acquainted with Mykonos’ tumbledown Old Town on this private, 2.5-hour walking tour. With your own personal guide, you’ll wander along narrow streets thronged with pretty sugar-cube houses. 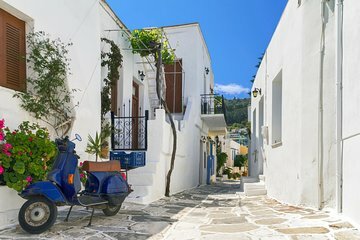 See the famous blue-and-white architecture that abounds in the Cyclades, and explore Little Venice, a shore-hugging neighborhood that affords stunning views of Mykonos’ famous windmills. You’ll also enjoy free time to sightsee independently or kick back at a terrace bar. A private guides gives you a choice of departure time plus convenient hotel pickup and drop-off. What a great introduction to Mykonos' Old Town. Our guide, Athina, was wonderful. She was extremely knowledgeable, enthusiastic and personable. She talked to us briefly to make sure she knew everything we wanted to see and then we headed out. Her knowledge of the history and culture of Mykonos was extensive and her advice on where to go and what to see was very helpful. And most of all, she is a warm, fun person to spend a few hours with. We visited the small streets, full of fancy stores, the windmills, the famous Panagia Paraportiani Church, the waterside tavernas, the windmill overlooking the harbor and much, much more. At the end of the tour she recommended an excellent restaurant where we had one of our best meals on Mykonos. For a short - but comprehensive - tour of Mykonos' Old Town, I would highly recommend this tour!